Salt Spring Island, at 193.5 sq km, is the largest of the Gulf Islands. The Island's population has grown to 10,234, according to the 2011 Census. ( A 6% increase since 2006 and the population was only 2000 in 1961). 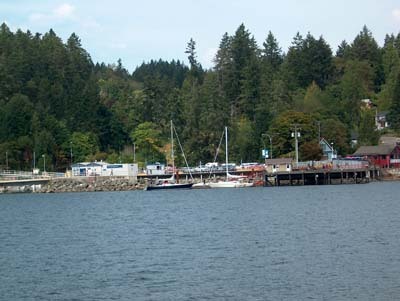 Salt Spring Island is the only Gulf Island with more then one ferry port. Ferries from Tsawwassen arrive at Long Harbour. Ferries from Swartz Bay arrive at Fulford Harbour. Salt Spring Island also enjoys a unique third ferry route from Vesuvuis on Salt Spring to the town of Crofton on Vancouver Island. Crofton is near the town of Chemanius, and about 45 minutes south of the City of Nanaimo. Many people live on Salt Spring and make an easy commute to businesses, jobs, colleges in Victoria, Duncan, and in Nanaimo. It's also very easy to do a day trip to Vancouver. Three regularly scheduled float plane companies also service Salt Spring Island. 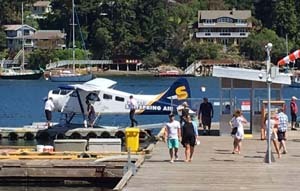 SaltSpringAir flies from downtown Vancouver to Ganges Harbour, and also from the "south terminal" of the Vancouver International Airport to Ganges Harbour. Seair offers regularly scheduled flights from the Airport to Ganges Harbour. Harbour Air also flies to downtown Vancouver, and also to the Vancouver airport. Easy to commute! Once on Island, Salt Spring Island offers a public bus service between Ganges and the three ferry terminals on the island. There are also taxis and a car rental service on the island. 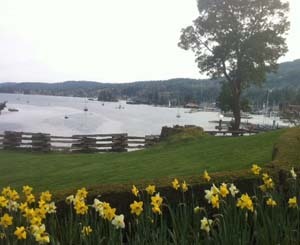 Salt Spring Island enjoys Shaw cable TV / high speed Internet services in most areas. Satellite connections, either Shaw Direct or Bell Express-Vu, are also available for areas not covered by cable. Telus, the local telephone service provider, also offers high speed Internet access on parts of Salt Spring Island. Wireless options are available in some parts of the island. Community water systems service some parts of Salt Spring Island sourcing from : Maxwell Lake, St. Mary Lake, Cusheon Lake, or Weston Lake. Many properties are on wells, either drilled or dug. Salt Spring Island is one of the best Islands in the Southern Gulf Island chain for availability of good water. Most properties are on septic systems, although the Town of Ganges, one phase of Channel Ridge, and Maliview are on community sewer systems. The main commercial centre for Salt Spring Island is the Town of Ganges. The are also various commercial ventures in the Village of Fulford. 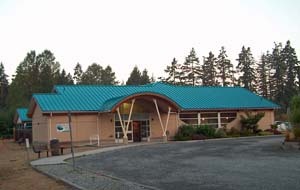 Salt Spring Island has an active Chamber of Commence, which runs the Tourist Info Centre. Salt Spring Island has astrong artistic base featuring ArtSpring, a performing arts centre. Swimmers now enjoy an indoor pool centre. Both ensures that Salt Spring Island remains both a beautiful place to live, and also a very interesting choice for a year round or a seasonal residence. Salt Spring has its own flag (a red maple leaf on a central white background, with a blue stripe on one side and a green stripe on the other). Salt Spring Island also has its own currency, which is supported by Canadian dollars, in the vault of the local Island Savings Credit Union, and which is accepted as legal tender at restaurants, galleries, etc., on Salt Spring Island. Designed by local artists, these monetary units are beautiful, as well as being an Island currency! Salt Spring Island divides naturally into a north and a south Island, each with a different topography. It really does take two days to drive around the Island, and to see the whole island. Salt Spring Island seems to break out into three and a half "areas" -- different forest (some is typical Pacific Northwest Coastal forest : cedar, fir, alder, maple, hemlock, Arbutus & Garry Oak groves. Also there are rocky knolls, bleached grasses, natural meadow areas. It's all part of the microclimate, and it's all beautiful. See Li for Successful Solutions! Buy Salt Spring Island real estate with Li Read. Contact Li Today!